A dual-phase formula with plant extracts for perfectly cleansed skin in a single step. diminishes the effects of pollution, detoxes. Ingredients* : AQUA/WATER/EAU, CYCLOPENTASILOXANE, CITRUS AURANTIUM DULCIS (ORANGE) FRUIT WATER, ISOHEXADECANE, BUTYLENE GLYCOL, SODIUM CHLORIDE, GLYCERIN, PHENOXYETHANOL, BENZYL ALCOHOL, PARFUM/FRAGRANCE, CAPRYLYL/CAPRYL GLUCOSIDE, DISODIUM EDTA, TETRASODIUM EDTA, BENZYL SALICYLATE, LIMONENE, BENZYL BENZOATE, BUTYLPHENYL METHYLPROPIONAL, LINALOOL, MORINGA OLEIFERA SEED EXTRACT, HYDROXYISOHEXYL 3-CYCLOHEXENE CARBOXALDEHYDE, HEXYL CINNAMAL, DISODIUM PHOSPHATE, CITRONELLOL, CITRIC ACID, EUGENOL, CI 15985/YELLOW 6 ?V3478A? Shake the bottle to combine the two phases. Moisten a cotton pad and sweep across the face to remove impurities. Turn over the cotton pad and smooth. Do not rinse. Rated 5 out of 5 by Jomi6 from Fabulous!! I love, love, love this product. It is so refreshing to use on a morning. Only a small amount required but it really revitalises my face and sets me up for the day. Rated 1 out of 5 by Sorrento06 from Dissatisfaction........ During my 20 years of using Clarins I’ve never reviewed or complained about any product. However this product has motivated me to review... 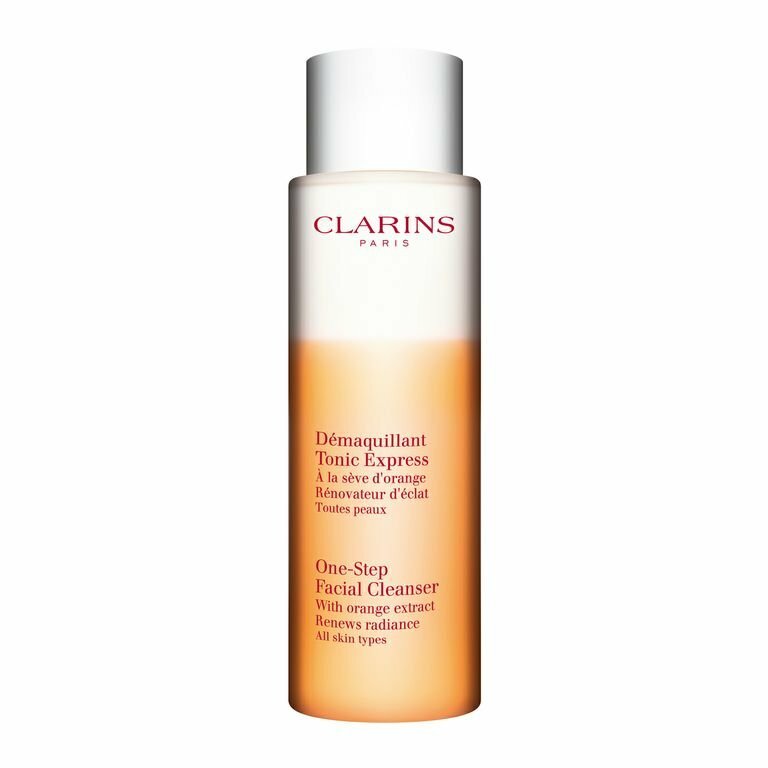 I am very disappointed and not very happy with the results and reactions my skin has had to this cleanser. It is extremely oily and is seperated in the bottle so have to really give it a good shake. It certainly does not remove eye shadow or mascara. I took it on holiday ( wedding anniversary) and after 3 days of use my skin started to erupt into spots. I do not normally have blimishes but this was dreadful. I thought I would try it again 2 weeks later but same has happened. Thrown it away. The upside it smells lovely. Sadly this is the only product I will never purchase again. Rated 5 out of 5 by Suzi70 from Love Absolutely love this cleanser! Takes everything off and leaves my skin really soft and clean. Have been using it for 2 years since the lady who did my wedding make up recommended it . Have tried others but nothing compares ! Rated 1 out of 5 by Anonymous from NOT removing mascara VERY disappointed. I am used to "layered" cleansers which you need to shake properly before applying so yes I am doing it right. This one is one huge disaster. It is under the "waterproof Make-up remover" title but it does not remove anything. It smudges mascara a bit and only ater the hard rub which leaves your eyes sore and black all around. Also it is extremely oily and the oil is hard to remove even with soap so there is no way is this "no need to rinse" thing. MAYBE it is meant for extremely dry skin and it only removes powder or foundation but you do need a soap to rinse it afterwards and no, it won't help you if you wear waterproof mascara like me. Waste of money. If you need a really good mascara wash buy their Instant Eye Make-Up Remover which is so perfect I wish they had it in huge bottles and I would buy a lot of them. This one is a disaster. Sorry Clarins. Rated 5 out of 5 by Mrstox from Best makeup remover I have used this for years and years, and I absolutely love it. I’ve tried several others during the years, but always come back to this. This removes even the toughest waterproof makeup without having to scrub to hard or soak to long. And I love the smell!